Harp music is ideal for these solemn occasions. Its ethereal and peaceful music lifts and soothes the spirits of the grieving and bereaved. You can choose favorite songs to be played or leave the decisions up to me and I will provide appropriate and beautiful music. Please visit my complete Repertoire List for all available pieces, or browse my smaller list of most-requested funeral music. For last-minute bookings, no contract or deposit is required. 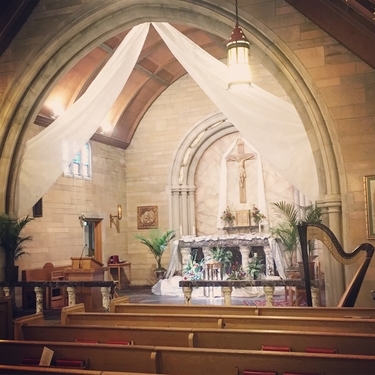 Booking includes coordinating with the family and funeral director, 15 minutes of pre-service music, any number of songs during the service itself, and 15 minutes of post-service music. Music for the graveside service and visitation, as well as the funeral luncheon or dinner, are also available. Contact me to check availability or request a quote.